The new metal band featuring current and former members of Strapping Young Lad, The Devin Townsend Project, Vimic, and Threat Signal has now given itself the name Imonolith. 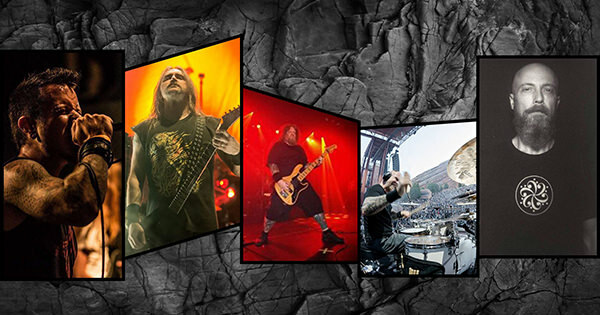 Imonolith, which is currently working on new music, is composed of vocalist Jon Howard (Threat Signal), guitarist Jed Simon (Vimic, ex-Strapping Young Lad), guitarist Brian Waddell (ex-Devin Townsend Project), bassist Byron Stroud (ex-Strapping Young Lad, Fear Factory), and drummer Ryan Van Poederooyen (ex-Devin Townsend Project). "Jed Simon had a list of over 50 band names he thought of over the years. He sent them to all of us in the band. The word 'Monolith' was one of the band names. It caught my attention and I started playing with the word. At first, I thought of various names with words in front of, or after the word Monolith, then I thought of 'I Monolith.' But it didn't sound right, so I added the letter 'i' to the front of the word 'Monolith' and voilà… Imonolith was born. A brand new word used for a band name. The guys dug it when I brought it up to them. It sounds heavy and is easy to say. So we're sticking with it! It still somewhat carries the meaning of Monolith, which is a monumental, black stone of significance. Sounds metal enough for us!"